Before the Thanksgiving break, at least three students reported experiencing “stomach discomfort”to the Center for Healthy Living, and many other students contacted the Nassau County Health Department with complaints of food poisoning. The Health Department conducted a health inspection of campus dining locations on Nov. 16. The Pioneer requested the results of the inspection from Aramark, instead a member of the Aramark leadership responded via email through Michael Berthel, dean of students. “Nothing is more important to us than food safety. We are committed to providing a safe and healthy dining experience everywhere we operate. The Department of Health indicated that the recent illness on campus was likely a virus and not related to the food service operations. A virus can be spread person to person in any environment where people are in closequarters. The food on campus is safe to eat,” Aramark leadership wrote. “We took this opportunity toretrain staff on our standardoperating procedures for theentire flow of food production. This includes providing an environment that protects the safety and integrity of food from its delivery, throughout its storage, preparation, transport, and ultimately, to the point of service to the customer,” Aramark leadership wrote. The students’ symptoms could have been caused by a norovirus. Norovirus is an extremely contagious virus that causes diarrhea and vomiting, according to the Center for Disease Control and Prevention, symptoms similar to food poisoning. “While there were no confirmed cases of food poisoning, given the similarity in symptoms, the University worked with its food service provider, Aramark, to take precautions as well. Aramark immediately brought on additional staff to ensure quality assurance,” Michael Berthel, dean of students, wrote in an email. Berthel is coordinating the possible virus containment with facilities services, the Center for Healthy Living and Aramark. There have been no confirmed cases of a virus at this point, according to Randy Burd, senior vice president of academic affairs. The university took action to disinfect and sanitize high-trafficked areas on campus. “We will continue taking all necessary measures to minimize the spread of germs as the season progresses,” Burd said in an email to faculty. The Center for Healthy Living emailed students with a health notice and prevention tips on Saturday, Nov. 17. The notice described symptoms of the norovirus, including diarrhea, vomiting, nausea and stomach pain. Most people sick with norovirus get better in one to three days, according to the email. Norovirus can be spread easily through direct contact with an infected person, consuming contaminated food or water and by touching contaminated surfaces and putting unwashed hands in the mouth, according to the CDC. 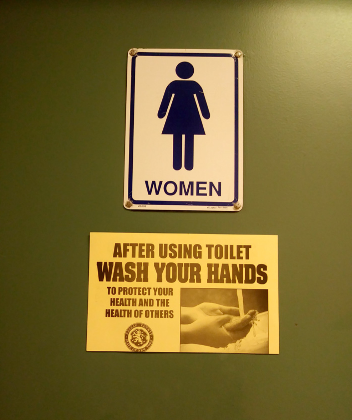 The Center for Healthy Living shared the guidelines from the CDC to help students prevent and contain the spread. Students were advised to take more sanitary actions, like thoroughly washing hands with soap and warm water after using the bathroom and before eating; disinfecting surfaces, especially after you vomit or have diarrhea; and washing soiled clothes with hot water and drying at the highest heat setting. Tove Sparrman, a senior international business major, was one of those who felt sick after eating at the Winnick Student Center. “I got a stomach ache. I thought I was just tired, but then I started throwing up all night,” she said. Sparrman attempted to report her symptoms to the Center for Healthy Living, but after three days of calling, she still couldn’t get through to the center. The centeronly recorded three students reporting symptoms before the break, and no further calls were received afterwards, according to Berthel. symptoms of sickness to report directly to the department. 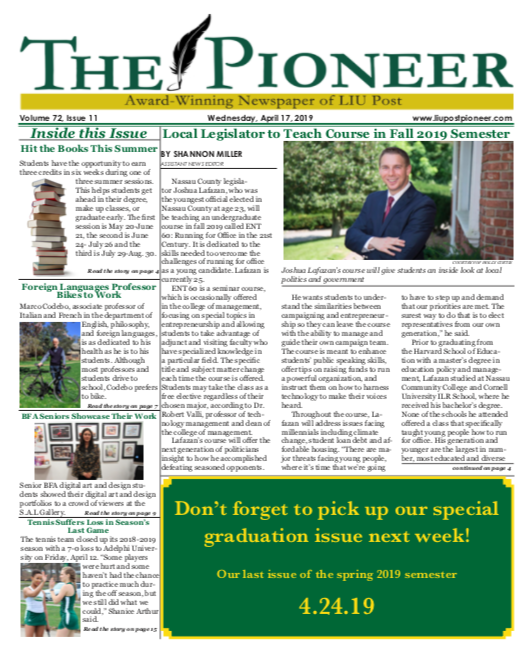 campus Like our page on Facebook @ LIU Post Pioneer for more news updates throughout the week. One student, who The Pioneer kept anonymous to protect their identity, shared a post on Facebook which condemned the university for allegedly blaming students as the cause. 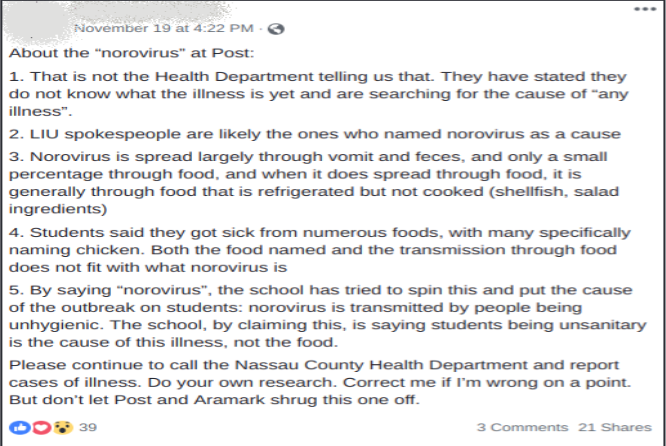 “By saying ‘norovirus’, the school has tried to spin this and put the cause of the outbreak on students: norovirus is transmitted by peoplebeing unhygenic. The school, by claiming this, is saying students being unsanitary is the cause of this illness, not the food.” the student wrote. Health conditions on campus are “not encouraging,” according to Juliana Caputo, a junior English education major. Caputo, a commuter student, believes there is more of a danger of catching germs on campus than at home. Since the norovirus scare, she is taking more precautions to avoid germs. “Most spaces on campus don’t look clean. Recently, the second floor bathrooms in Humanities had empty soap dispensers for over a week,” she said. While a cause has not been found yet, the university took precautions. “Over Thanksgiving break, an extensive cleaning protocol was implemented by both Aramark and Facilities to prepare for students to return. 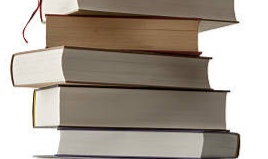 Since then, no students have reported any symptoms to the Center,” Berthel wrote in the email. Students experiencing symptoms of norovirus can call the Center for Healthy Living at 516-299-4162, or the Nassau County HealthDepartment at 516-227-9697.